Retire in Tennessee to beautiful lakefront property on Watts Bar Lake. Picturesque Real Estate near Knoxville, TN. Luxurious Tennessee Real Estate on Watts Bar Lake in beautiful Kingston, TN. Affordable land prices entice you to retire in Tennessee, here in this quaint, southern, East Tennessee town. Ladd Landing is beautiful Tennessee real estate on the lakefront of Watts Bar Lake in Kingston, less than 20 minutes west of Knoxville, TN. Want to retire in Tennessee? Looking for luxury Tennessee homes with gorgeous lakefront views? Well, this is the perfect place to build your dream home. Ladd Landing is made up of 800 acres with more than three miles of shoreline and 4 miles of fabulous walking trails. Home sites range in size from 1 to 4 acres and are available with dock rights, lake views, mountain views, deep woods or various combinations of these natural amenities. It's picture perfect Tennessee real estate. The developers of this Tennessee Lakefront Property began building Ladd Landing in 2002. In addition to beautiful building lots, Ladd Landing also offers model homes for sale, custom-built homes, lakeside and lake view condominiums, lakefront and lake view lifestyle cottages, and our onsite town center. Ladd Landing’s Town Center offers more than 100,000 sq ft of retail, medical, dining and hospitality... complete with a grocery store, hardware store, dry cleaner, dentist, ophthalmologist, medical plaza, vet services, and our authentic southern cooking restaurant. Ladd Landing is designed around the concepts of New Urbanism with the architectural themes of the Old South. 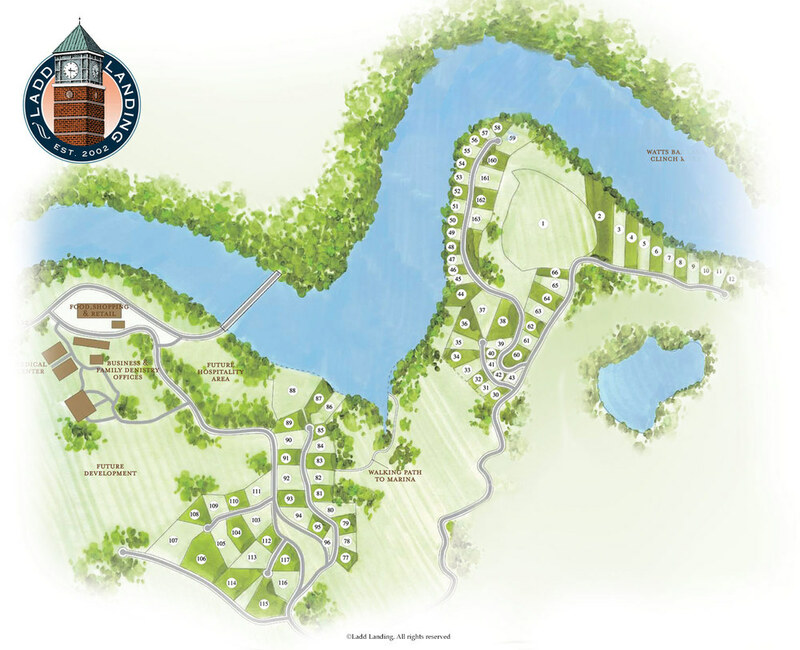 Made available through the vision of the Ladd family, local developer Matt Caldwell, and Skip Wyatt of Foil Wyatt Land Planners of Jackson, Mississippi, we invite you to take a thorough look through our site before deciding that Ladd Landing is the place you want to retire in Tennessee. From the entrance to Ladd Landing, you are just a short drive to more than 2,000,000 sq. ft. of retail, dining, hospitality, recreation & healthcare at Turkey Creek of Knoxville, all located less than 20 minutes away from home. If you have any questions or don’t find the information that you are looking for, give us a call at 865-803-5225. We welcome the opportunity to speak with you about this luxurious Tennessee real estate. Should you decide this property is something that interests you, request one of our information and pricing packets. If you want to visit Ladd Landing and take a closer look, we have accommodations waiting for you here onsite.